A few signals are finally starting to reach oversold levels, but there's nothing to mark the extreme levels normally associated with more meaningful bottoms. 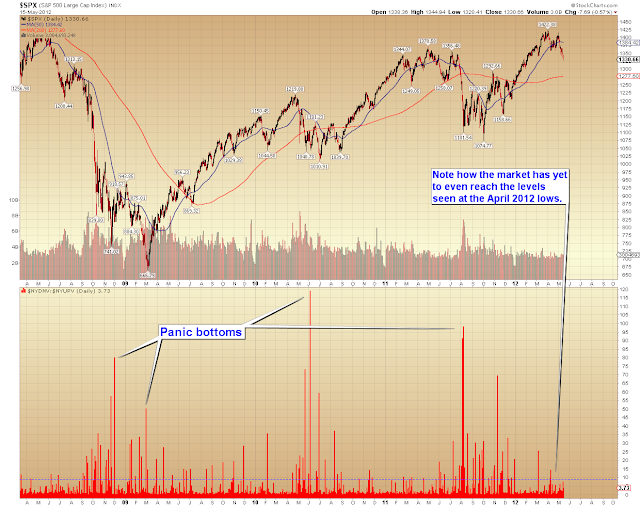 Below is the chart of the NYSE down volume to up volume ratio. Note how most meaningful lows are coincident with significant selling. 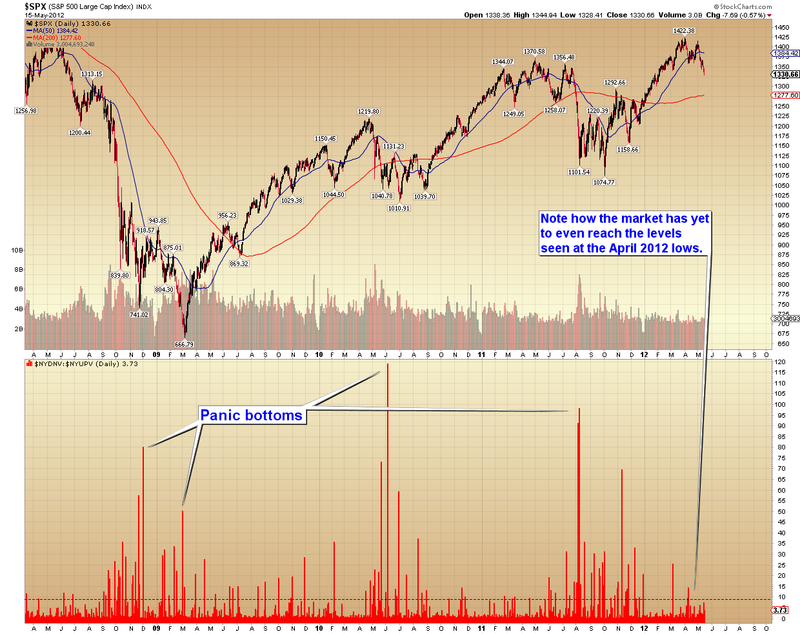 So far, this decline hasn't even reached the selling levels of the April 2012 low. This of course doesn't preclude short-term bounces, but it's hard to see an intermediate-term bottom forming yet. This tells us that the real selling hasn't even hit this market; it appears the bulls are holding "long and strong" for the time being. I've said it before: markets don't need tons of sellers to drop -- all they need is a lack of buyers. Perhaps ironically, this is when the market is the most dangerous. Few realize that crashes usually start when the market is already oversold, not when it's overbought. The numbers are telling us that the real sellers haven't stepped in yet -- so it appears the decline is currently being driven primarily by short-term traders and algo-bots. This is a market ripe for an "event." If things continue to muddle along and the real sellers don't ever step in, then the market will most likely continue to move in a reasonably orderly manner. But if this market gets spooked by something while in this position, it could easily spark a panic wave. As I've said for the past couple weeks, the market is still in dangerous waters. Moving on to the projections, my intermediate term outlook has remained unchanged for the past couple weeks, and I've continued (and still continue) to expect lower prices for the bigger picture. The question now is exactly how we'll get there. Up until a couple days ago, the short-term targets were being hit perfectly... then the charts got a bit messy, and have stayed that way. 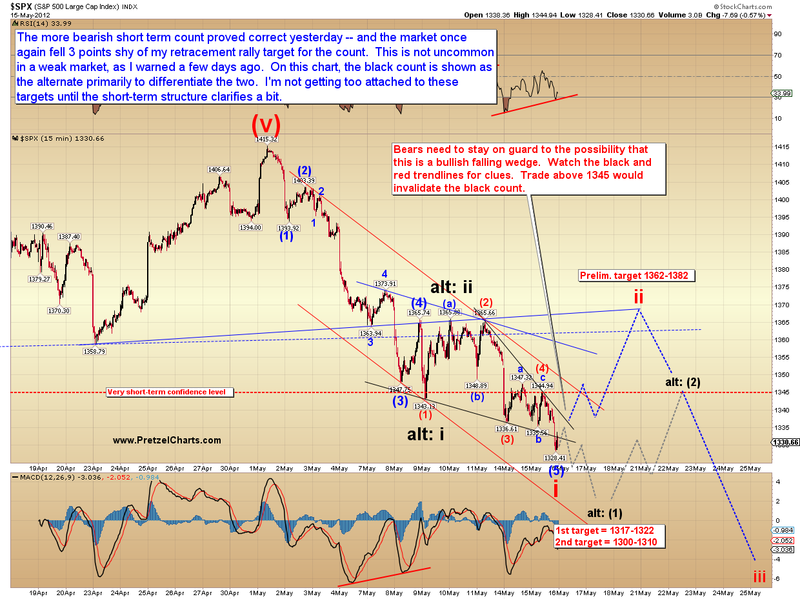 The chart below shows two potential short-term wave counts; one is immediately bearish, the other is short-term bullish. Both roads are assumed to lead to the same intermediate term outcome, as shown above. I'm favoring the count shown in blue and red by a very slim margin. I have labeled the black count as the alternate, but there's really nothing in the charts to give me a reason to strongly favor one result over the other. I should also mention that there is a third option not shown on the chart below, and that's for a repeat of the fractal shown between black alt: ii and red (2) (called an "expanded flat"). I'm sorry the short-term charts are so messy right now. Blame the market -- I don't make the charts, I just read 'em. Things should become clear again soon. In conclusion, it will be interesting to see if the bulls can get anything going here, or if the buying strike will continue. As of this moment, there are some reasons to suspect a short-term bounce may be in the cards, but as yet still nothing to indicate a substantial bottom. Trade safe. I'm really tempted to relable the chart... I think the count labeled as the altenate might be right. This mess is characteristic of a diagonal. PL, any way to shift the time to a EST time stamp, that is the hours and minutes? Other blogs have this. This is what I said 4 hours ago. In this way one can pair anyone's post with a chart and see exactly when a call was made. - One question for PL: Is there a reason you did not mention or indicate the MACD and RSI divergences, which are rising against this week's drop in SPX? Interesting article, I just read it. His reasoning seems sound. 1280 would seem a good barrier. That was the level that was broken to really get things moving up. Thanks for taking the time to comment on this! Most appreciated! What you think about that chart? Katzo, do you think 36.5 es was it? can't get to 40es. God job with today's article PL...actually had something timely (at the time) but forgot to hit "post" before I went out this a.m.
Possible. Triple zigzags are extremely rare animals, but it can't be ruled out of course. Huge EUR drop from 1.2757 to 1.2720 (bearish) but with minimal effect on stocks (bullish). Am I seeing this right, a nice impulse off the overnight now on the ES? Looks like w4 right now, w5 to take to katzo's 40 area? Am I seeing something not there? Looks like an impulse up off the lows in SPX. ST bottom might be in. Given the sharp market correction in May, could the FOMC minutes (being backward looking) have a less significant effect on markets this time around? Any one catch the comment Tyler had on his market wrap up over at ZH yesterday. Buying ES at the open and selling at the European close, and shorting ES at 2 EST and closing at NYSE bell has been profitable the last 8 out of 10 days. Curious to see how it plays out today. lmao, I love how Disqus tries to hotlink it. Thanks! My caution: High beta (RUT)'s action relatively not confirming. IMO, let 'em run without me - a rally to short. PL, great article. Can you explain the expanded flat between red ii and blue (2) on the 3rd chart? I'm just trying to get a better understanding of EW. Just like I called yesterday afternoon - rotation into smallcaps, transports and tech yesterday before the LTRO 3 rumor today. Amazing how EW analysis + Intermarket analysis allows you to be pretty successful in predicting the news. Great article as always PL. It's amazing how everything in Europe is all fine and dandy today! Once again, this proves your theory PL that news headlines are almost always manipulated in order to fit the current EW pattern. I'm sure the situation in Europe will "deteriorate" rapidly once this bounce is over. Short at ES 1339. Possibly only a ST trade. Well, it's more that EW patterns track sentiment, so the news sentiment follows the patterns -- they're on the same page, it's just that the charts are leading and the news is lagging. would love to see a longer term chart (hourly over the past 6 weeks?) to see what you're talking about. An expanded flat is a corrective pattern... in a downtrend wave a is 3-waves up, wave b is 3 waves down and exceeds the start of a, then wave c is five waves back up and exceeds the start of b. They're popular patterns because they blow out stops on each side of the trade. I think I saw what you were looking at. Higher high on the 1 minute with divergence in the macd - yes? That, combined with a complete 5-wave rally. When it's that clean, it's easy money, as long as you get in and out quick, because you're probably trading counter-trend if it's a five wave move... unless it's part of an expanded flat or the final c of an a-b-c zigzag. katzo, could you toss up one of your ES charts w/ the waves labeled please? I'd love to see if I'm labeling the waves right on this impulse off the o/n lows. I'm grinding though the F&P book and working on correctly seeing the waves. Thanks. Have any of you guys ever tried out Bullish Sentiment from Marketvane? katzo, bang your computer monitor again and get the selling started!! Unless this is part of a rare "running flat," the ST bottom is probably in for now. Back below 1328 and something else is going on. What you are watching today or maybe a 2-3 day? Thanks, and may you be blessed with an abundance of katzos! hey, we have to name something after PL, maybe a pretzel? some chart or candle form? suggestions? SPX or ES re: 1328? IF it breaks 1328, then that rally was the c-wave of a running flat... very weak market if that happens. That's a rare pattern. I thought he had coined the "blimbo wave". Well, obviously something "twisted" or salty (pillar of salt that presages a big down swoop for us short freaks?). Katzo, just wanted to say thanks for the tips on watching the MACD 0 crossovers. Been watching and learning from them this morning. Yahoo - nice ride up! Thanks. I'm just not seeing it. Blue (2) has me confused. And if I have to explain the old pillar of salt and its Biblical origins, then it won't fly. Reuters is reporting that the ECB has stopped monetary policy operations with some Greek banks. It still feels like the whole market is waiting to see if RUT is going to hold the neck-line. It probably feels that way because I am short RUT. lol! The VIX went up with the SPX in the last 30 minutes. I am getting IT sell signals, guess what, another twin pipe on the 120, a billa up that was busted with a katzo down. Tgt I am getting on the 120 is 1316, maybe not today tho. could happen real soon. . . Precision on so many levels. Awesome. Let me illustrate something about the levels I provide. These tgt levels are pure EW mathematical levels. What I call meaningless spikes do not count, unless, of course, you got stopped out. One might say, katzo, the recent low on ES was 20.75 and I said the tgt was 25. You missed katzo, you do not know squat. But I argue, voila, look at that candle body on the 120. The TF bid is the only thing keeping it up. This has been the case for the last few sessions. Plus the $TRAN remain stronger today than the rest. The $RVX is climbing so something is gonna happen soon imo. Appreciate all your insights. So IT, you don't think low is in at 1328? What are you thinking the 'something' is? Yeah, it's tough. Thanks again for mapping out your thought process here. New York advance/decline line has crossed below zero about 15 minutes ago. What are TF and RVX ? Thanks. Down. Needs to break 775.97 imo. The moon transits has another stab tomorrow. To trigger the self-preservation instinct. Not professional read, though. I nailed this decline at the top - and they literally top-ticked my stop! It's about the dreaded tail. Then, again, if one doesn't have a stop . . . well, Murphy's Law will always prevail. Nice call, K7! Gotta love this game. I could easily be wrong, but I don't see market having big break down the day before FB IPO prices. That would scare off a lot of easy money people who are 'buy at any price' just to say they got FB in the IPO. Took a small stab long es at 29.50. Will reverse short at es 26. Looks to me like day traders are the only ones driving price action today. Everyone else must be waiting for someone else to blink. careful here, not lookin for a big break but a retest of recent lows. Hi Katzo, would you be willing to make any comments on tomorrow's action in case today's market breaks down? TIA! This whole FB thing is interesting. Saw a poll in the paper today that said of those polled (don't know who they were) 50% think it is overvalued. And that might have been before they upped the price and # of shares being offered. A good % also called it a 'fad' and something else would come along. Time will tell. I'm a little worried about the # of Puts vs. Calls expiring this week on SPY, heard talk about this and that it could fuel a nice pop in the indexes. There's the FOMC minutes due to drop at 2:00 PM. And isn't this an options expiry week also? no comment, take one day at a time in this mrkt. BTW, my pre-bell tgt of 40 was missed by one quarter (.25). I suppose this means we will chop sideways until 2pm EST. Was too busy looking for EW in the charts to think about the FED minutes. That implies several lower lows with retests of the 1400 range. I suppose it's possible. Thanks! PL, your article from yesterday @ Minyanville is showing up as a headline when you view the quote on RUT on Yahoo! Finance. Look at you, Mr. Bigshot! Time frame, multiples of PL & K7 and others. Days, maybe a week, whatever. Scaling in and (if profitable) scaling out - keeping trailing stops. TZA 17.18 was my stop-out px (RUT 830) carrying to the low 780's before the chop. Wuddah, cuddah - - - 6 day trade - - - in my dreams. And yet another twin up move with VIX and SPX... Weird and weirder. katzo - What's your current take on AMZN? possible mini-flash crash ahead ad $RUT breaks 775, see how it is holding? fundamentally everything is going great for the bond and the u s dollar.........in fact, we may be in the throws of a deflationary move in risk assets that will wring out leveraged players and some non leveraged long term holders of risk. so far the trillions thrown against the wall by the fed in hopes that short term economic growth, over the last 4 years, would stick has only taken our debt and world debt to levels never endured by civilized nations. the miniscule growth weve seen is now flattening and rolling over into what may be a recession here.......europe is burning economically and will be literally soon. china is slowing markedly as is south america. the U S A is the best looking horse in the glue factory as my father has said many times. the fed owns trillions in u s bonds as do the chinese as do the japanese as do central banks and other huge investors.... they are not holding u s long bonds for inflationary reasons......they are holding them for deflationary reasons. when the fed and others begin to unload bonds it will be at the 2% to 1.5% level which insures they make a killing on them to help offset the huge losses they hold in other soverigns. and i anticipate they will reenter the risk asset markets again only after deflation has transferred enuf wealth out of the publics hands and traders too. watch for govt action forcing community banks, pensions and other huge pools of the publics money to invest in u s treas bonds when those yields get the 2% area and lower....they will b left holding the bag. Oh, come on... Is this one of those headfakes / manipulations upon release of the FOMC? Interesting move in the RUT in the last 30 mins...a nice V...looks like we're heading back down. Interesting read, thanks for sharing. What would you say would be the best way for people to position / prepare themselves for this if it plays out as you said? FOMC minutes - basically QE3 still worth considering but NOT RIGHT NOW. in which direction? think they are grabbing stops in every damn direction. anyone else get sick watching this? F l a s h c r a s h . . . . . . . . . .
No QE3? I hear QE4 is going to be a free iPad for everyone! Codename: Operation Angry Birds. Apple to 1000! get short, take Dramamine. When it's trading at 1310, you won't care whether you got short at 1325 or 1330. I must say, this is the most fun I've had in the market in quite some time. And a big Thank You to PL and K7 for all you do. go rick santelli go!!!!! man did he just pound on jarrod idiot boy........Santelli for president!!!!!!!!!!!!!! I'm convinced at this point they don't know WTF to do (or they do, but aren't gonna tell us anywhews) so they just blow hot air out of all orifices. Idiot Boy Jarrod has been a mouthpiece for the demopols (leaving out the 'n' for demon) since way back. He's right down at the bottom of the brains ladder with Robert Reich (the IV). Say, wherever Bob_E is, I hope he's happy with CVX. It's been a steady earner, as Tony would say. For dinner this evening we are pleased to present the specialty of the house, PL's black count. It is a delicious combination of nested 1's and 2's along with a hint of expanded flat. It pairs exceptionally well with a vintage Katzo7. Wed was bad, but not noteworthy terrible. Thursday was flat. Friday you thought was bad until you came in Monday and got -23% in one day....Life did go on afterwards, it wasn't all survival bunkers and spam. Friends, Roman's and countrymen...lend me your ears. I'm back from a far away place and I have some Nenner-ism's for you. I will post shortly...and glad to be back in the good ole USA. Are you short or will you wait and buy the bottom? Charles Nenner's "watch out" point is 1325 on the SPX. We're close. the CNBS anchor said "JPM only lost their own money" -- NONE of "their" money is their money!! It's all taxpayer dollars...the big banks have NO CAPITAL!!! what little they do have is from TARP bailout - not to mention the ZIRP and QE ongoing bailouts! %$&*%^%$$$%^$%!!!~!!!!!! they saved it, bounced it right off 25 again second test. close above 1345 and 2625 would give reason for a bounce. Gold & Silver continue on a sell signal a move to 1370 on Gold and 23 on Silver is possible. Crude is holding around $93 but daily and weekly cycles are still down. breaking $93 we could see $68. US Bonds the 30 year could go as high as $149.15. close below $143.20/30 yr $132.20/10 yr or 118 on TLT will be a sell signal. Euro...sell signal continues, but a close above $128.50 EUR/USD will cancel the sell. Thank you for this wisdom! Slay the ego for trying to top-tick then sulking away if you didn't get it like a 4 year old toddler slamming doors. Ahhh! The regrets keep piling up. Started nibbling at SNE. 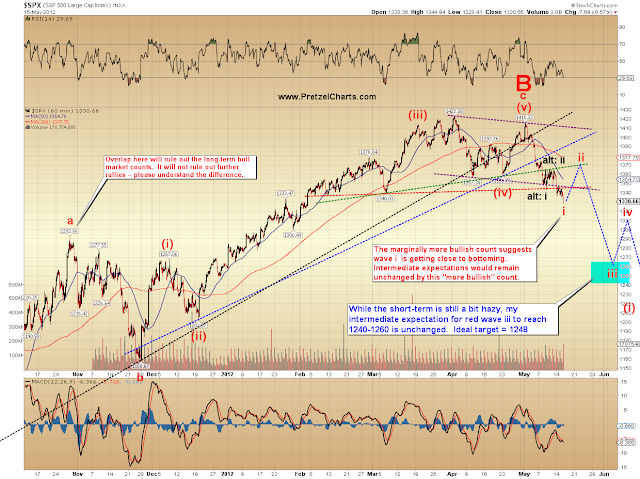 Fifth wave target is $13.62 and we are close. Has been under accumulation since 4/18. 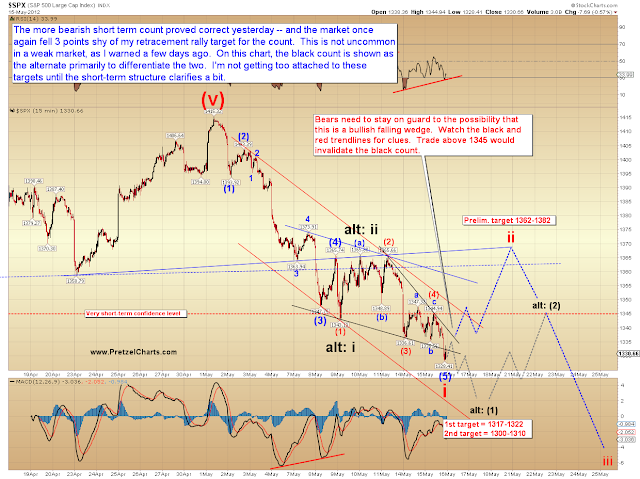 Small position here and will add as soon as a five wave up corrects. It looks like the party is just about over, and they're about to turn the lights on...longs are about to see what their dates really look like. Lived in Tunkhannock for 20 years. It's cold up there. Philly boy myself. another headfake before the final down move?? DX is rallying big time again..